Be advised that a lot of terminology used in this tutorial is aimed at people who have an already in-depth knowledge of the Halo 1 BSP creation process. Weather polyhedra are used by Halo to define volumes in a BSP where weather particles such as snow, rain, and swamp bugs cannot spawn. This technique is frequently used in the Halo 1 campaign where you transition from interior sections to outside sections with weather. Without weather polyhedra, going from an interior cluster to an exterior cluster with weather would cause the weather to just instantly appear, which isn't realistic. There is little explanation offered as to how these work. Tool offers no failure/success information when you attempt to implement them. And the icing on the cake: you can't even view these in Sapien like you can with portals. The only evidence to go off of is the information Guerilla offers on some of the single player BSPs in question, and a really unhelpful description offered by the HEK tutorial. Going by what the HEK tutorial says, you could assume these work in a similar fashion to occlusion portals; but, Guerilla gives a few extra hints that we aren't simply dealing with flat polygons- we are dealing with actual 3D volumes. It's unclear exactly what is accepted by Halo as a polyhedron; the definition of a polyhedron is a solid figure with many plane faces, typically more than six. (Source: Google) After reviewing the average amount of planes per weather polyhedron in the campaign maps, I've drawn the conclusion that these must be simple primitives such as cubes. I've experimented with using more complex volumes and experienced a lot of failures. If needed, the simple cube volumes can intersect to form larger, more complex volumes. Here is a demonstration of weather polyhedra in 3ds Max on a port of Halo 2 Lockout. The level needs to have nice transitions between indoor areas and outdoor areas with snow. Here are the weather polyhedra that need to be implemented to keep snow out of the indoor areas. As you can see, some intersect each other, and some aren't perfect cubes. These have been tested and work fine. This is what the scene looks like as it's ready to be exported. A common problem you may encounter relates to weather particles seemingly phasing through walls in areas where they shouldn't be. There are a few things to consider like the size of the weather particles, how strong the wind is, etc. Those are possible sources of problems, but the easiest solution is to simply enlarge the weather polyhedra sizes. The example above isn't exactly the intended use of weather polyhedra, I suspect. I believe they're mainly intended to be used at transition points in a linear level where there are long hallways that open up to exterior areas. In those situations, theres no chance of particles bleeding through walls since you can enlarge the weather polyhedron as big as you want outside the sealed BSP. One last thing of note, if you want to be a nice guy and include weather polyhedra in your map even though you don't intend to use any weather particle systems, that's very helpful for anybody who wants to mod your map and add weather particle systems in the future. This tutorial is available in PDF here: https://www.pdf-archive.com/2017/11/17/halo-weather-poly-tutorial/. It will be rehosted here and a few other places eventually. I read a bunch of theories that weather polies work just like portals, and that is completely false. I legitimately think that nobody in the history of Halo CE has ever figured this out. Interesting. From looking at the tag it appears that each polyhedra is defined by a sphere which the polyhedra planes jut off of based on their plane vector's angle and distance from center. From looking at it, it appears that they can be more complex than boxes, but unless I have some proof I'm not going to guarantee this. EDIT: After taking a good look at it I believe the way it stores the polyhedra is by fitting a sphere around each one, and calculating planes that make up each face. This is actually pretty efficient since they can could use this to quickly check if a point is definitely NOT inside the polyhedra, meaning a particle CAN spawn(just check if the distance from the point to the sphere's center is greater than the radius). 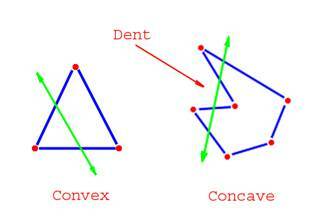 If it IS inside the sphere, they just need to test if the point is behind each of the planes inside the polyhedra. I'm not 100% certain, but this SHOULD mean that weather polyhedra MUST be convex objects. According to guerilla they can have up to 16 coplaner faces, just as long as the object is convex. I've been wondering about weather polyhedra forever, and had always assumed it had something to do with keeping weather particle effects from being obnoxious to interiors, but have never seen anything explaining how they work. This makes sense and agrees with the tests I performed. Edit- Ew Moses did you stick HTML code into your post? Trying to quote you was a train wreck. Nope, no html for me, just that bbcode for the image. Also, maybe try making a hexadecahedron and see if that works for occluding weather. Would certainly prove my theory and make your tutorial more complete. Time: Tue April 23, 2019 1:21 PM 234 ms.